We have had an AMAZING weekend so far! We have had MANY MANY people in our home and I have loved every minute of it. Just in case you didn’t know….I get VERY stressed out VERY easily. But…..this weekend I have embraced this quote and moved on and enjoyed what has come my way. Neighbors keep dropping by (something I always wanted but honestly, it stressed me out at one point b/c I want a PERFECTLY clean house). But…. it is what it is!!!!!! And I have carried this fact over to my work. My two week observation window was during the past two weeks. During this “open” window, I have hardly let the fact that my principal could show up at any moment phase me. I surprised myself. One day my principal was trying to figure out when to observe me and finally came up with a time on PICTURE DAY! RIGHT AFTER pictures. She asked me if that was okay and I just chuckled and started to make excuses then exclaimed that IT IS WHAT IT IS. The cute frame was given to me by my dear friend, Tiff. She found it at Canton and knew it would be at home with me. This might not be the most spiritual quote but if you think about it….. It goes back to something my mom always said. AND I hated it! You can’t change all the circumstances around you but you most certainly can change and control how you handle it. 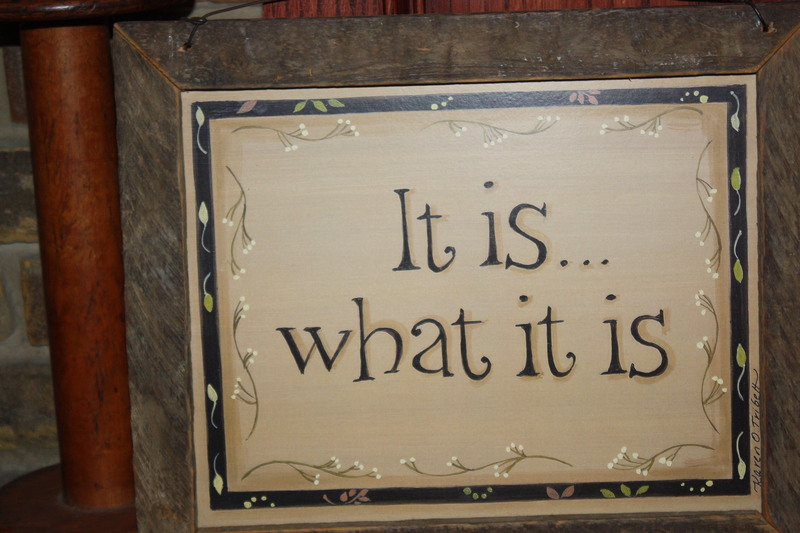 So…she was basically saying “It is what it is” so deal with it in a way to glorify the Lord. This entry was written by texasknights and posted on April 22, 2012 at 12:00 pm and filed under Deeper Me (maybe). Bookmark the permalink. Follow any comments here with the RSS feed for this post. Post a comment or leave a trackback: Trackback URL. Amen, sister!! But you know you’re preaching to the choir! 🙂 Love all your pics and posts….you are an amazingly honest and refreshing gal and that’s what I love about you most! Keep on keeping it real!